For 4 years in a row (2000 - 2003) , Galapagos was rated as the #1 best overall dive destination in the world by Rodale's Scuba Diving Magazine's "Readers' Choice Awards"!! The climate of the Galapagos Islands varies from season to season and year to year, and there is quite a difference in temperature between the coastal areas and higher elevations. Due to the effect of the cool Humboldt Current, the climate of the Galapagos Islands is generally mild and dry, with the temperature rarely rising above 80°F. From May to December, when the winds blow in a southeasterly direction, the shores of the southern islands are bathed in cool waters, chilling the air and creating unusually cold conditions for equatorial islands. During this period, rain is scarce on the coastal regions. Only plants that can survive long periods of time without water -- such as lichens and cacti -- thrive in these areas. Higher up, however, clouds of moisture support the thick vegetation. The rainy season, which lasts from January to April, is marked by decreased winds and warmer sea currents. The days are warm and the seas are calm during these months. Heavy rains in the upper elevations send streams of water down the slopes to even the lowest island points. About every seven years, the Humboldt Current is interrupted by El Nino, which drives warm waters that are normally sent westward by wind and the Earth's rotation toward the shores of South America and the Galapagos Islands. The warm seas bring very heavy rainfall to the region. El Nino usually begins in December and lasts a few months. Sometimes, a particularly severe El Nino can cause floods, landslides and other destructive natural disasters. The most recent major El Nino event began in the autumn of 1997, resulting in significant increases in rainfall as well as air and water temperatures throughout 1998. Though the conditions have been excellent for vegetation on the Galapagos Islands, certain animals, particularly those that live in the sea or depend on it for food, haven't fared as well. Warm seas have altered the food chain, severly affecting the marine iguana population. Many seabirds, sea lions, fur seals, hammerhead sharks and other fish have disappeared from areas where they may normally be found and have been spotted searching for food in places they usually avoid. Meanwhile, waved albatrosses, penguins and cormorants were virtually unable to breed successfully, and a greater number of marine iguanas than average died in 1998 because the supply of green algae, one of their primary food sources, was so scarce. 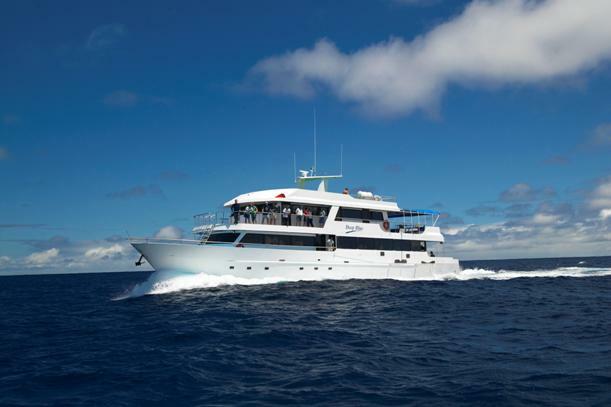 How many Dives should you expect on the Deep Blue Galapagos Diving Yacht? The amount of time available on any given day. The Galapagos Islands are located directly on the equator so the days in Galapagos are exactly 12 hours long every day all year long. The islands are far apart and there are many of them. There may be a two to three hour boat run between dive sites. Darwin and Wolf are 14 to 20 hours from the other islands depending on seas, wind and current. Most of this long run is done during the night but you still must leave the south by early to mid afternoon to get to Wolf by the morning. When you are not up at Darwin/Wolf there are incredible land excursions to do. Each land excursion typically lasts 2 hour land excursions plus on many days you can snorkeling with sea lions and penguins. Safety issues - You must have surface interval between dives. You must wait an hour or so after you eat before you dive. You must wait a minimum of 24 hour hours before flying and most yachts will not start the last daylight dive of the day after to 3:00 PM. This last rule is because there are very strong currents and the next nearest land is 4000 miles to the west. A lost diver at night is in serious trouble. If a diver is separated from the group (which is common) and the dive takes 1 hour, this give the crew 2 hours of daylight to find them. Night diving is the exception rather than the rule. Remember that this is open ocean diving with strong currents. The main attraction is not reef but the pelagic large animals off the reef. A lost diver in Galapagos is a serious problem especially at night. Therefore night dives are done in coves and are not available on most nights. To give you an idea of the number of dives, you can typically expect one or two dives plus one or two hikes plus snorkeling . At Darwin/Wolf you have time to make between 2 - 4 dives the first and last day up there depending on what time you arrive and what time you have to depart for the south. On days where you are there all day long you have time to make between 3 and 4. 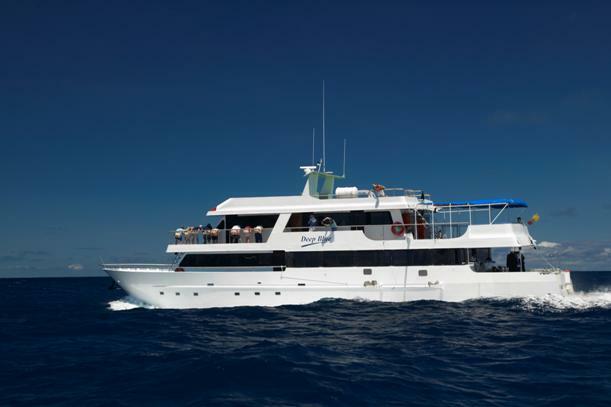 On a 7 night Darwin Wolf trip you will typically make between 16 to 20 dives.